One of the first blooms of spring, the gardener who is impatiently waiting is always glad to see the tiny clusters of miniature grape hyacinths begin to bloom. After a few years, the blooms may falter from overcrowding. At this time, you might wonder about digging and transplanting grape hyacinth bulbs. 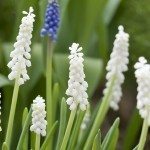 Can You Transplant Grape Hyacinths? Moving grape hyacinth bulbs from one area to another is a great use of the multiplied plant. It takes several years of growth before this plant stops blooming because of overcrowding in the bed. If your bulbs have been growing in the same spot without division for a long while, you can transplant grape hyacinths into other spots in the landscape. Learning when to transplant grape hyacinths is not hard, because they are flexible and quite tough. Botanically known as Muscari armeniacum, moving grape hyacinth bulbs is best done in late summer. You can also begin transplanting grape hyacinth bulbs in autumn when you’re moving, transplanting and planting other spring blooming bulbs. You can even move grape hyacinth bulbs in spring. Replant them quickly and water in and you might even keep the bloom. It is easier to find the bulbs if you dig them in summer, however, before the foliage is completely died back. Using the planting technique of layering, you can transplant tiny grape hyacinth bulbs near or even on top of other spring bulbs with a later bloom time. If you must move grape hyacinth bulbs at another time of year, they will probably survive. Leave the foliage intact until it dies back. Start by making a small trench around the entire cluster of foliage. As grape hyacinths are propagated by the small bulbs (called offsets) that have grown attached to the mother bulb, you’ll want to dig the entire bunch and then separate them. Offsets that have developed a root system will easily break off. When moving grape hyacinth bulbs, take the biggest offsets to plant alone into their own space. Leave the tiny new bulbs attached to the mother for another couple of years. When transplanting grape hyacinth bulbs, you can separate the smallest if you like, but they may not flower for a couple more years and may not have enough energy to survive alone. Dig a wide, shallow hole for the bulbs you’re transplanting. Grape hyacinths do not need to be planted close together; allow room for offsets to develop. You can also transplant grape hyacinths into a container for a full sun area indoors. Now that you’ve learned how to transplant grape hyacinth bulbs, you’ll find many areas of the landscape where they’re a welcome addition.